Disputes are an unfortunate part of life whether personal or in business. We understand that conflict, however arising, is both stressful and distracting and we work closely with clients to find innovative solutions and resolution, often outside of the Court system, as swiftly as possible. Our corporate, employment and commercial departments provide cross practice support wherever and whenever required. Our premium advisory service in commercial litigation helps you ensure a successful outcome. FS Legal is particularly well known for dealing with high-value, ‘big ticket’ complex litigation for national corporates and high net worth individuals and are frequently quoted in the press including the Financial Times, the Mail on Sunday, FT Adviser, Citywire, Moneymarketing and IFA Online. We advise on all aspects of litigation including commercial contract disputes, insurance disputes, sports litigation, shareholder and partnership disputes, breach of warranty and guarantee claims, defamation, international asset tracing, international freezing orders, injunctions and judicial review. We have a unique and unrivalled expertise in the financial services sector acting for both the professional advisor industry and individual investors. We have successfully recovered millions of pounds for investors caught up in investment scams, failed tax schemes and high profile fund collapses. 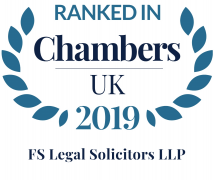 FS Legal is particularly noted by Chambers & Partners and Legal 500 for our leading expertise in claims against professionals. Our team has unparalleled experience in this area and typically pursues multi-million pound claims against the whole range of professionals and their insurers. In particular, we bring claims against other solicitors, surveyors, architects, valuers, geotechnical engineers and other construction professionals. For more information please see our dedicated Professional Negligence, Tax Negligence and Financial Services Litigation pages. Unlike many commercial firms, we do not act for banks, insurers or other large institutions. This allows us to represent clients with disputes against well known high street banks. We act solely on our clients’ behalf with transparency and without the restraints caused by conflicts of interest; our priority is to minimise your disruption allowing you to focus on your business. FS legal also has a specialist team that deals with high value construction disputes. Counting Morris Homes Group among its clients, FS Legal acts in arbitrations, adjudications, expert determination and has a great deal of experience of cases in the specialist Technology and Construction Courts. For more information please see our Construction Litigation page.